WinCalendar is a easy to use Windows Date Picker & Microsoft Office Calendar Creator. Both the date picker & calendar creator integrate with Microsoft Word & Excel for ultimate flexibility. 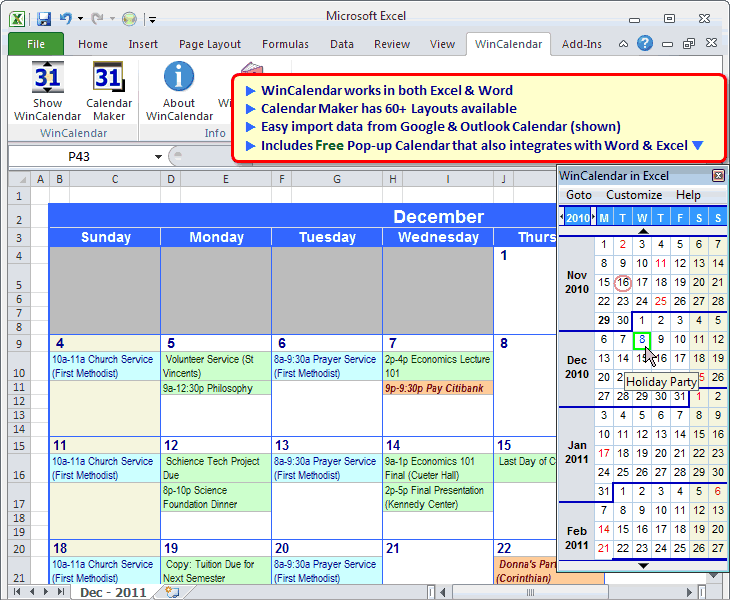 Use WinCalendar to convert Google Calendar, Outlook Calendar, Yahoo Calendar & iCal data to Microsoft Word and Excel format. The calendar creator supports importing Google/Yahoo/Outlook Calendar data into the following layouts: Monthly Calendar; Weekly Calendar; Schedule; Agenda; Gantt Chart (Timeline) WinCalendar comes with a free desktop calendar and date picker that also integrates with Microsoft Word & Excel. It supports Holidays for 10 countries. You can even save your own daily appointments in the calendar. WinCalendar is customizable & works dynamically from a menu so there is no Calendar template to load & manage. This site does not contain serial number, crack, keygen WinCalendar for Windows, Word and Excel serial number : serial number is the simplest type of crack. A serial number(cdkey,product key,etc) is register the program as you may already know. a crack or keygen may contain harmful software. If you cannot find the exact version you want, just give it a try. for more information read .nfo/.txt/.diz file include in zipped file.